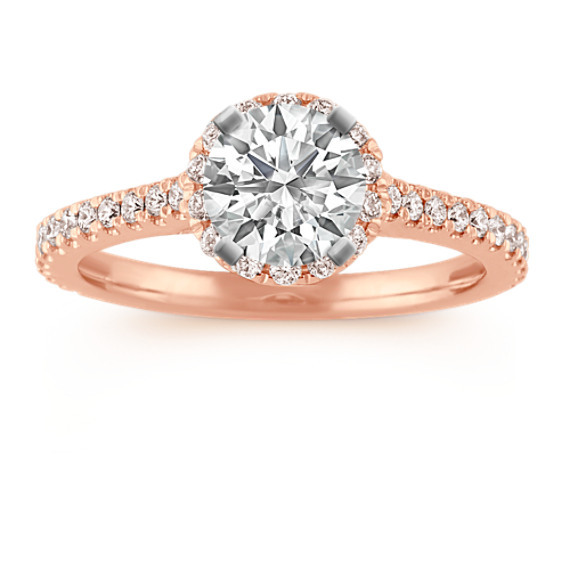 Halo Diamond Engagement Ring for 0.75 Carat Round in 14k Rose Gold | Shane Co. The 0.75 carat round diamond of your choice will beautifully complete this ring, as part of our exclusive Eternally Yours Collection. This setting was created to hold your chosen diamond flush with 58 round diamonds, at approximately .41 carat total weight, surrounding it in a halo of abundant sparkle. The diamonds have each been hand-selected for maximum fire and are pavé-set in quality 14 karat rose gold. Look to the profile of this amazing setting to see the accent of diamonds along the bridge of the ring. Gemstone Carat Weight :.41 ct. t.w.